The Texas Bill of Sale Forms legal documents that will prove the legal sale and purchase of items between businesses and individuals or private parties. These forms will provide important information with regard to the buyer and seller, change of ownership and any specific identifying information regarding the item(s) being sold. Some forms may require notarization. Boat Bill of Sale – Use this document to prove the legal sale and purchase of a vessel. May also be required for registration by the new owner. General Bill of Sale – This form would be used, generally, between two private parties to prove the sale and purchase of personal property. Firearm Bill of Sale – This document would be utilized in the sale and purchase of a firearm in the state of Texas. 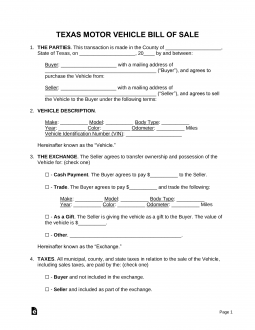 Vehicle Bill of Sale – Use of this document would prove the legal sale and purchase of a motor vehicle in Texas. This document is often used in the registration process. Form VTR-346 – Must be sent within 30 days to TxDMV Vehicle Titles and Registration Division, PO Box 26417, Austin, TX 78755-0417 after the sale.